Today I am joining some Bento Bloggers and Friends on a Holiday themed bento blog hop. Since we already had quite a bit of snow this year, I ended up with a Frosty themed lunch and snack. My 10 year old nephew did all of the amazing drawing (food safe markers) on the snowman shaped cheese quesadilla and he ate this lunch. 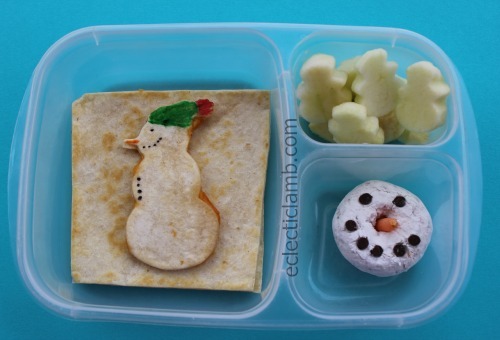 I wanted to make something else in the snowman theme so I made this fun snack. Thomas bagel thin with cream cheese, dried blueberries, and a dried apricot. Please click on the button below to see what Jackie of Loving Lunches made to share with you. This entry was posted in Bento / Cute Food, Food, Uncategorized and tagged bento. Bookmark the permalink. Thank you so much! Your comment made me smile. Your nephew did a great job on the snowman. 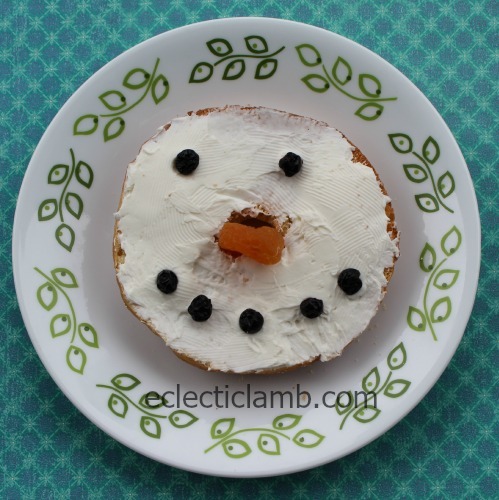 The snowman bagel looks delicious! Love the snowmen – adorable. The bagel thin is a great idea! I love the snowman doughnut. yummy! the snowman donut is super cute!